Theoretical ESR spectrum buildup as a function of two-photon detuning δ and drive time τ, for a Rabi frequency of Ω = 3.3 MHz on the central transition. Credit: University of Cambridge. 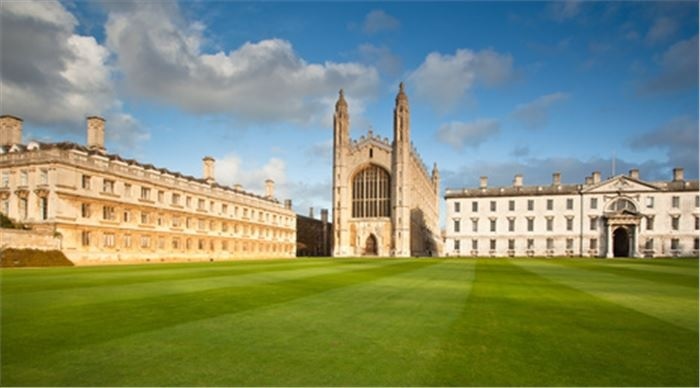 Led by Professor Mete Atatüre from Cambridge’s Cavendish Laboratory, the researchers are exploiting the laws of quantum physics and optics to investigate computing, sensing or communication applications. A hypothesis for Planet Nine was first announced in a 2016 study [The Astronomical Journal]. Astronomers studying a dwarf planet in the Kuiper Belt noticed that several TNOs were “detached” from the strong gravitational influence of the Solar System’s gas giants, and had weird looping orbits that were different from the rest of the Kuiper Belt. A process similar to guitar tuning improves storage time of quantum memory. A quantum internet promises completely secure communication. But using quantum bits or qubits to carry information requires a radically new piece of hardware – a quantum memory. 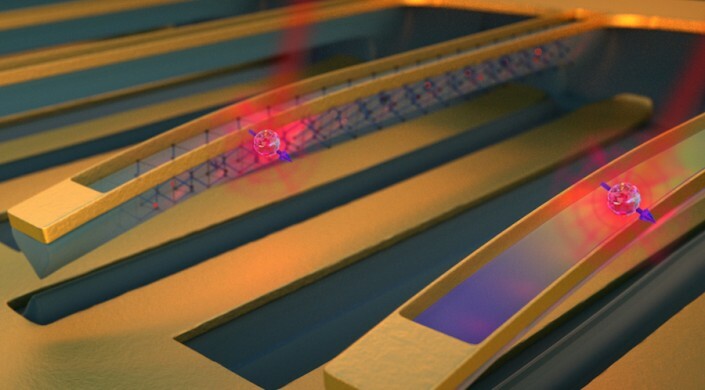 This atomic-scale device needs to store quantum information and convert it into light to transmit across the network. A major challenge to this vision is that qubits are extremely sensitive to their environment, even the vibrations of nearby atoms can disrupt their ability to remember information. So far, researchers have relied on extremely low temperatures to quiet vibrations but, achieving those temperatures for large-scale quantum networks is prohibitively expensive. Now, researchers at the Harvard John A. Paulson School of Engineering and Applied Sciences (SEAS) and the University of Cambridge have developed a quantum memory solution that is as simple as tuning a guitar. The researchers engineered diamond strings that can be tuned to quiet a qubit’s environment and improve memory from tens to several hundred nanoseconds, enough time to do many operations on a quantum chip. Impurities in diamond, known as silicon-vacancy color centers, are powerful qubits. An electron trapped in the center acts as a memory bit and can emit single photons of red light, which would in turn act as long-distance information carriers of a quantum internet. But with the nearby atoms in the diamond crystal vibrating randomly, the electron in the center quickly forgets any quantum information it is asked to remember. To improve memory in a noisy environment, the researchers carved the diamond crystal housing the color center into a thin string, about one micron wide — a hundred times thinner than a strand of hair — and attached electrodes to either side. By applying a voltage, the diamond string stretches and increases the frequency of vibrations the electron is sensitive to, just like tightening a guitar string increases the frequency or pitch of the string. Next, the researchers hope to extend the memory of the qubits to the millisecond, which would enable hundreds of thousands of operations and long-distance quantum communication. The research was co-first authored by Young-Ik Sohn and Srujan Meesala from Marko Loncar’s group at Harvard, and Benjamin Pingault from Mete Atature’s group at the University of Cambridge. Researchers from Harvard SEAS, Harvard Physics, Sandia National Laboratories also contributed to the manuscript. The research was supported by the National Science Foundation-sponsored Center for Integrated Quantum Materials, Office of Naval Research Multidisciplinary University Research Initiative on Quantum Optomechanics, NSF Emerging Frontiers in Research and Innovation ACQUIRE, the University of Cambridge, the ERC Consolidator Grant PHOENICS, and the EPSRC Quantum Technology Hub NQIT.